Sitting on my bookshelf right now is the weirdest book that I have ever come across. ‘Elephants on Acid and other Bizarre Experiments’ is a book by Alex Boese, which cannot be described better than its title. The cover boasts proudly: “From zombie kittens to tickling machines: the most outrageous experiments from the history of science.” How could I resist? After taking a quick detour to read the zombie kitten one (yes, they actually did come back to life, somewhat), I moved on to the main feature. The section describes the results and the aftermath of an experiment in which an enormous dose of LSD was administered to an unfortunate elephant named Tusko. However, a certain sentence, mentioned in passing, caught my eye: ‘there were reports of (LSD) curing alcoholism overnight’. LSD as a cure for alcoholism - how strange. I’ve always been curious as to how LSD produced its effects. However, I had never heard of it having any non-recreational effects. How would this work? A quick review of the drug’s pages on PubChem and the NIH’s Hazardous Substances Data Bank revealed all the chemical basics. Lysergic Acid Dimethylamide (C20-H25-N3-O, Molecular Weight: 323.42g/mol, CAS #: 50-37-3), or simply ‘acid’, is a hallucinogen that grew in popularity in the 1960’s. The drug is semi-synthetic and is produced by reacting diethylamine and lysergic acid. It forms colorless, pointed prisms due to its 3 benzene rings. It has four possible stereoisomers, of which only the D-form is active. The drug is administered orally, either in tablet form or incorporated into sugar cubes or thin pieces of paper (blotter papers). LSD has potent effects, causing hallucinations and extreme euphoria that can last up to 12 hours, at which point it is degraded in the liver to form the inactive 2-oxo-3-hydroxy-LSD. I've added a Marvin sketch of all the structures, as well as the crystal structure of LSD below. The exact mechanism of how LSD produces its effects is still unknown. However, it has been established that it can work as a serotonin receptor agonist and antagonist. 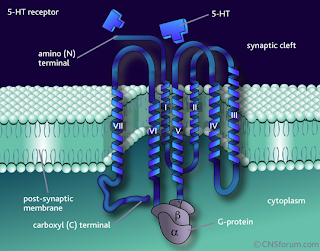 Specifically, LSD is thought to act on the 5-HT2 receptor – a postsynaptic receptor for serotonin, aka 5-HT (pictured on the right). As I learned in my neurobiology class, serotonin is a neurotransmitter that controls mood, and is released primarily by the Raphe Nuclei. The Raphe Nuclei are the target for selective serotonin reuptake inhibitors (SSRIs), commonly known as antidepressants. 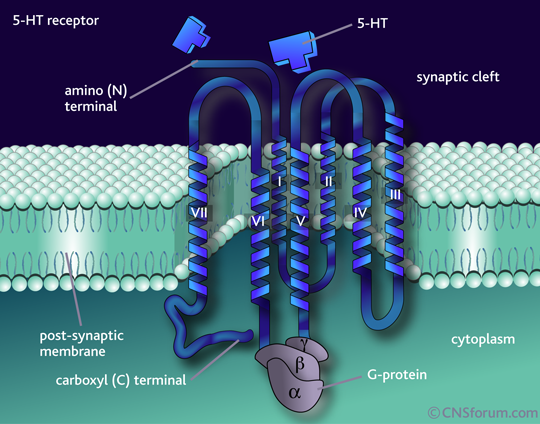 5-HT2 receptors are excitatory G-protein coupled receptors, which mean that they cause a cascade reaction by activating other proteins inside the cell. One effect of 5-HT2 is to promote Ca2+ release. Ca2+ helps the release of synaptic vesicles into the post-synaptic neuron. Thus, by inhibiting 5-HT2 receptors Ca2+ release is inhibited, leading to the interruption of the Raphe pathway, and an effect on the person’s mood. I read on Pubmed that LSD inhibits the Raphe Nuclei pathway, and so this information seems consistent with my classroom learning. Now for the claim that LSD can cure alcoholism. Since it was made illegal in 1966, LSD has been a difficult area to study. However, a quick google search brought me to a recent study in which researchers performed a meta-analysis of previous studies to try to determine the effects of LSD usage on alcoholism. The study combined the results from 6 studies done in the 60’s and 70’s, in which a total of 536 alcoholics were considered. Of these, 325 were randomly assigned to be given a single dose of LSD, while the other 211 served as controls for comparison. The control group varied from study to study – two opted for a much smaller dose of LSD, one for dextroamphetamine (the drug found in Adderol, used to treat ADHD), and the other three opted for no treatment. The methods of each study are summarized in the table below. Based in the composite study, treatment with LSD resulted in a significant improvement in alcohol abuse, up to 6 months after treatment. The 12 month follow ups were less successful, indicating that if LSD is to be used as a treatment, it would likely require regular dosing. I’m not sure that this study answered my questions – it was far from definitive. Each of the studies compiled here, when taken individually, were inconclusive. Also, the six studies varied largely in their set up. Not only were the controls groups treated differently, even the experimental groups had differences. 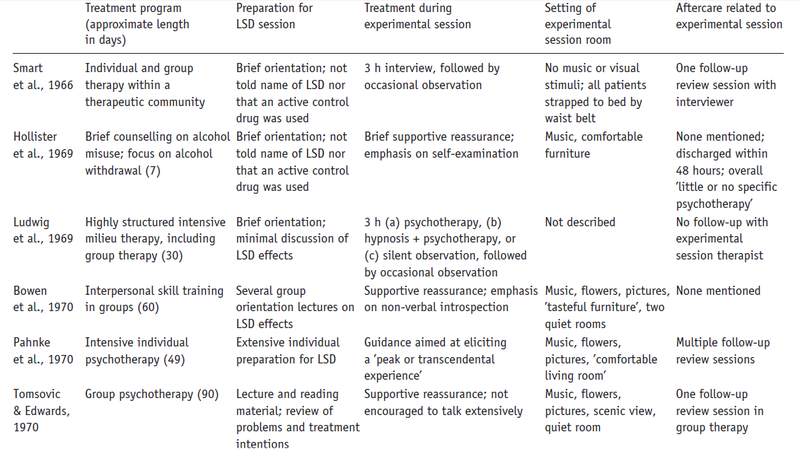 Some of the studies offered the subjects counseling prior to their LSD experience, others did not. Even the amount of LSD that was administered in each study was different. Also, different studies had different standards for determining whether the treatment had been successful. Some required complete abstinence from alcohol, while others needed only a decrease in consumption. While the researchers of the meta-analysis made every effort to account for these differences, the compiled data does not hold the same clout that one individual study would have. On looking further, I came across another study that may lend support to the claim. Researchers found that concurrent use of LSD and consumption of alcohol resulted in the blocking of the subjective effects of the alcohol. It seems they are all inhibited by LSD. Although this is not exactly the same topic of research as the earlier study, it does show a correlation between alcohol and LSD. 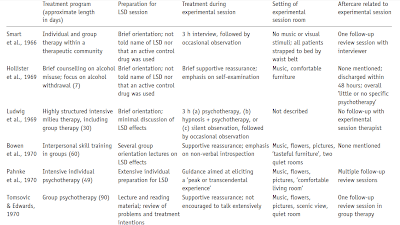 Twenty-one subjects were interviewed, to retrospectively comment on their experience with taking LSD and alcohol concurrently. Yes, I know this doesn’t seem reliable – people high on LSD may not be the best judges of how drunk they are. But bear with me. Some of the participants reported drinking a fantastic amount of alcohol without feeling the effects whilst on LSD. One subject had had 18 beers, half a bottle of liqueur and 13 ounces of vodka while on LSD, and felt the effects of the alcohol blocked. The researcher argues, and I am inclined to agree, that merely the hallucinogenic effects of LSD could not have overcome the effects of that much alcohol. In fact, all the subjects reported that the effects of the alcohol were blocked, or at least diminished, by the use of LSD. The study proposes a mechanism by which the two intoxicants might be connected. It seems the 5-HT2 receptor is implicated in the mechanism for ethanol’s action. By binding to the receptors more tightly, LSD prevents the effects of 5-HT2 excitation by ethanol that leads to the subjective response to alcohol. The researcher also mentioned something that I hadn’t come across in my previous reading. Apparently, LSD is actually an agonist of the 5-HT receptor, but only very weakly so. However, the binding affinity of LSD to the receptor is so great, that better agonists are not able to bind the receptor. 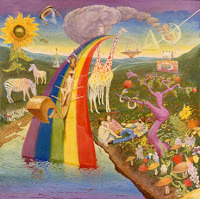 So, LSD is only an antagonist in the sense that it does not allow better agonists, like alcohol, to work. While the idea of LSD being used as a cure for alcoholism is interesting, and works well in a research laboratory, I’m not sure that it is necessarily the route to take when dealing with alcoholics. However, perhaps LSD could provide a platform on which to base a cure for alcoholism. Research could be done into finding a compound that can elicit the same effect on alcoholism, but without the hallucinogenic effects. Krebs, T. S. & Johansen, P-O. J. Psychopharmacol. http://dx.doi.org/10.1177/0269881112439253 (2012). 2. 2. Robert O. Pihl, et al. "Hallucinogenic Drugs Attenuate The Subjective Response To Alcohol In Humans." Human Psychopharmacology: Clinical & Experimental 15.7 (2000): 559-565. Academic Search Premier. Web. 16 Mar. 2012. I found this a very interesting blog post. I had no idea about that LSD could have such affects. My question is that what about the effects alcohol has other than mental state including liver damage. I realize that it blocks the serotonin receptors in the brain preventing it from firing the neurons but I didn't quite get how it would be an effective method of curing alcoholism if there are still severe effects of alcohol. Overall though, I think you did a great job and offered valuable insight on a new topic that is very difficult to research given the restrictions of the drug. Amazing job! Your article is very interesting and very easy to follow. I had no idea about some of the affects LSD had. I agree with the post above, the main questions being, how exactly does this mechanism work I realize that that can be a hard task but I was particularly interested on the affects of the body. My interests for your post is how can a drug cure something so well, and are there any other advances in medicine for this drug? Overall, good job I enjoyed reading your post!